Valentine’s Day is about celebrating with the ones you care for the most, not worrying about where to go or what to do… Let us do the picking for you! Whether it be for a few hours, or just the two of you celebrating all weekend long… Wilmington and the Brandywine Valley has what you need to feel the L.O.V.E. If you’re looking for a fancy night out look to Krazy Kat’s Restaurant right off Route 100. With an overly creative American Cuisine menu and whimsical décor it’s an experience you won’t want to miss. Another fine dining option with some comforts of home is The House of William and Merry located minutes outside of Wilmington, Hockessin, Delaware. Owners Bill Hoffman and Merry Catanuto give “opening their home” a whole new meaning. Nothing less than an amazing meal and a cozy atmosphere will come from this renovated 1922 farmhouse. Romance is always in the air at Hotel Du Pont. On February 14th bring your significant other to the Green Room and devour a four-course meal created by Chef Keith Miller. While you are dining enjoy the sounds of Sinatra performed by Sean Reilly. 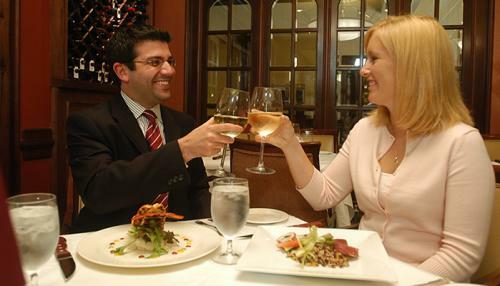 *Click here for a list of more amazing restaurants in Wilmington & the Brandywine Valley. “O” is for the Opportunity to experience date night in a new way! How about dinner and a show? Candlelight Theatre is dining, and entertainment wrapped up in one. In February, the musical ‘Guys and Dolls’ comes to town and brings you on a journey to Times Square and back while you feast on an all you can eat buffet. Don’t forget a glass of wine to set the mood! If plays aren’t your cup of tea, then maybe an evening walking along Wilmington’s Riverfront, popping in to restaurants, grabbing a drink, eating some ice cream, or just taking in the beautiful sights, is right up your alley. “V” is for the mini Vacation you will have when you “Getaway” with us! Explore even more of Wilmington & the Brandywine Valley when you stay for the weekend in one of our Bed and Breakfasts. With their accommodating and unique features, you can’t go wrong. You may also want to check our Getaway Deals and Discounts to find specials running throughout Valentine’s weekend. From car services to overnight accommodations we have got you covered. If you want to skip out on picking and choosing, and you want an all-inclusive getaway, look to Hilton Christiana and their Romance Package. This package includes overnight accommodations, a bottle of champagne (or non-alcoholic cider) AND your choice of breakfast for two at the buffet or breakfast in bed and room service… With checkout at 1:30 pm we know what we would pick! Don’t forget to make reservations for dinner at their Market Kitchen and Bar - this this farm to table dining experience will make it a night to remember. Can’t celebrate Valentine’s weekend? That’s okay. The Hilton wants its visitors to feel loved ALL YEAR LONG, so this exclusive package is yours for the taking all the way through 2019! How awesome is that!? We can’t wait for you to feel the LOVE in Wilmington and the Brandywine Valley. Happy Valentine’s Day!